Its FA cup day, probably our most important game this season so far, we can’t afford any slip ups, no banana skins please. Today re-joining Fuggles, Citra and Parker, we are once again in the presence of Pharp back from his vacating in the Shetlands. All necessary precautions need to be undertaken, hopefully we haven’t slackened our guard over the past 3 outings. First check is to establish what Pharp has consumed over the past 24 hours, hopefully no baked beans, mushy peas or Brussels sprouts and most importantly no curries. Second check, the electric windows are in fine working order. Third check, have we got the gas masks? All set we’re on our way, Parker is really pleased with his new car sticker adorning the back window ‘Pharp on Board’. With Market Drayton being the home of Muller, (no Citra, not Daisy Muller, calm down and button up your raincoat) the yogurt, Rice and Corner producers. Getting mullered must be a great possibility, especially with all the good real ale pubs in close proximity. Just a five minute walk would get you to all 4 pubs on our list. First port of call and a useful parking slot for a couple of hours is the Red Lion, brewery tap for Joule’s brewery. The brewery was closed for many years after being gobbled up by Bass Charrington. Those were dark days indeed before CAMRA had enough consumer power to be able to lobby against such travesties, thankfully re-founded again in 2010. Unfortunately, the old brewery building in Stone was knocked down in 1974, much to the annoyance of the locals. However, a warehouse does still remain intact on the canal bank. A new brewery has now been built in Market Drayton with many original recipes and brewing methods made available by Molson Coors who gobbled up Bass Charrington. Plenty of info here: Joule's History. 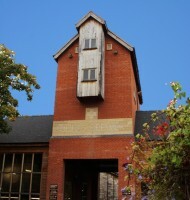 A magnificent new brewery building which must have cost a pretty penny, not just thrown together but a well-designed structure with a considerable amount of oak cladding. Inside the Red Lion is also immaculate, although the old pub is now only a small part at the front of the new extension. Citra went for the Blonde, one we’d supped last week in Stratford, the ale was, as you would expect, in superb condition, pristine clear with a tight head clinging to the glass. Pharp and Parker went for Slumbering Monk, deep copper coloured premium ale coming in at 4.5%, a rich malty ale, once again pristine clear with a tight head. I went for the Pale Ale, the original Joule’s Pale Ale, delightfully refreshing ale, just enough bitterness, just enough malty flavour in perfect condition at 4.1%, lovely. By now several more Poppies supporters had now come into the bar, all admiring the surroundings, nodding in appreciation. Speaking to many supporters later at the game it would appear that many went to the Red Lion and all had nothing but glowing comments to make. I now moved onto Calcutta 1757 a typical IPA, with Market Drayton’s most famous son Sir Robert Clive as in ‘Clive of India’, this ale is most appropriate. The ale commemorates Clive’s first winning battle in Calcutta February 1757. This light amber ale has some clout coming in at 5.0%, hoppy, honey, spicy, once again in pristine condition, marvellous. Citra followed up with the Pale Ale whilst Pharp stayed with Monk. The Red lion manages to be a good pub for a Friday night out with the lads and also somewhere to take the better half and friends for a decent meal and a few drinks. The Jazz night looks good offering 4 pint jugs of ale for a tenner. Brewery tours also available. The temptation to stay at the Red Lion was strong; however, we had other pubs to try out so we moved onto the Clive & Coffyne. Or at least that’s where we thought we’d gone; unfortunately, inadvertently we walked into Tudor Rose. It was clear from the outset that we’d come into the wrong pub, but it just didn’t register. The two cake stands with various sponge cakes should have given us a clue. The purple rinsed octogenarians sipping tea should have given another clue. At the bar we expected 3 hand-pumps there was only two, yet still it didn’t twig, we just moaned that it wasn’t what we expected. One of the pumps had run out; this was from the Big Shed brewery Engineers Best, sadly not for us today so we went for Goffs Lancer. The very nice lady serving at the bar tried to convince us this was also brewed by Big Shed, the pump clip clearly pointing out it was brewed in the Cotswolds. We just said we didn’t realise the Cotswolds stretched so far north. Nevertheless the ale was ok, slightly hazy, straw coloured coming it at 3.8%, the head was clinging to the glass, pleasant enough. We were clearly in the wrong pub, ever felt like a prat? We swiftly moved onto the Salopian Star, the oldest pub in Market Drayton. There can be no doubting that this pub is for blokes, a glitter ball, many spot lights, brass stuff adorning the walls, a couple of dart boards and Sky sports on the two tellies. 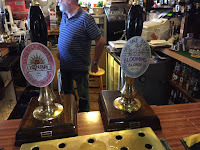 But most importantly; they had 3 hand-pumps, two serving Battlefield ales, another local brew the other adorned with a hand-written pump clip; Holdens Gold. Pharp went for the Battlefield Amber, you can guess what colour this premium ale is, at 4.5%. Rich and malty, it was in decent condition, clear and a clingy head. Citra & I went for Battlefield Gold, a nice thirst quencher at 3.8%, reasonably hoppy with a malty taste. Once again the ale is in decent condition with a tight head clinging to the glass. We only had the one pint and moved onto Greenfields the home of the Gingerbreadmen. The name derived from the large number of bakers that once filled the High St specialising in baking these spicy treats. With Billington’s claiming to be the world’s oldest surviving baker, originally from Market Drayton now knocking them out in Barnsley. A pleasant ground for this level of footy, in one corner was a small stand, sort of tucked out of the way. I guess this is here to ensure Market Drayton have the required number of seats. More unnecessary expense imposed by the footy authorities, seats in a stand that will probably only get bums sitting on them once in a decade. I was hoping this stand would be sponsored by Muller, they could have named in Muller Corner. It was at the ground where Pharp regaled us with his tales from his Shetlands fishing trip. He was telling us how strong the wind was; really! On one trip he proudly pronounced that they had been ‘blown off’, you can imagine the sniggers amongst the Poppies supporters listening in. Apparently, ‘blown off’ is a term which relates to their boat being shifted off their fishing ground by the wind? You would have thought Pharp could have used is powers to counteract anything Njord could throw at them. The game, well it was FA cup day and we triumphed 5-0. So we go into Monday’s draw for the next round which is played in two weeks. After the game we took the short trip to Cheswardine and the Red Lion, home of Lion Tale’s brewery. A small pub with huge steps leading up to the front door, a single bar with two serving areas opens to both rooms with two hand-pumps on each. 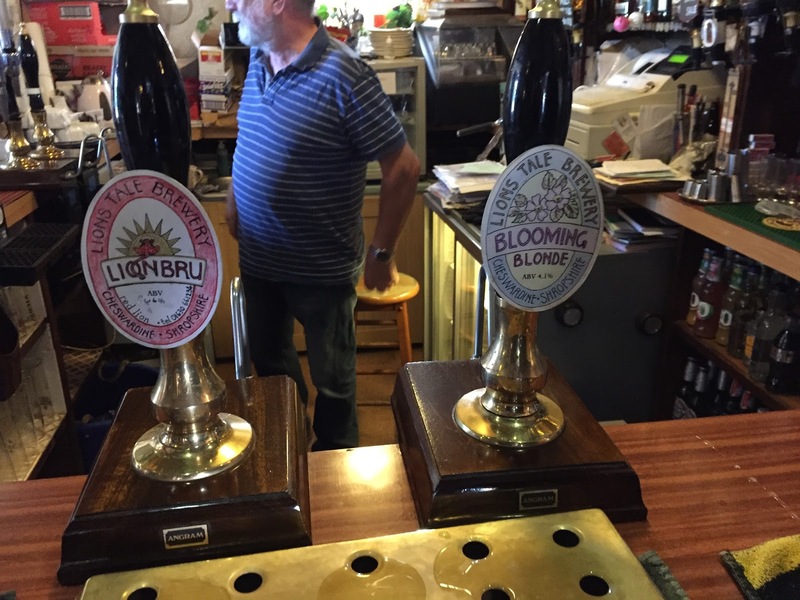 On the bar where we were sitting was Blooming Blonde and Lion Bru, on the other bar was Ches Brewnette and a Marston’s ale we didn’t really take any notice of it. The pump-clips were hand-made, micro-brewery in deed. Citra and I went for, as expected, the Blooming Blonde, pale with the slightest of haze, quite bitter with an unusual flavour. We couldn’t quite put our finger what the flavour was, there was some zest, perhaps a little yeast, sour taste, different none the less, at 4.1% it was OK. Pharp and Parker went for Ches Brewnette, dark mild, chestnut redish colour coming in at 4.5%. This also had a sour taste similar to the Blonde, the lads struggled with it to be honest, and they didn’t have another. The Red Lion sells little individual pork pies; the temptation was far too great to ignore them so Citra and I had one each. This was a delightful pork pie, crusty pastry, full of peppery pork, no jelly but that didn’t matter. The pies are made by Matthews butchers in nearly Newport, delicious and well worth £1.35 each we paid for them. Citra and I finished the day off with the Lion Bru, lovely ale 4.6% rich bitter, good condition, tight head clinging to the glass. Whilst there we met the local CAMRA (Market Drayton sub branch) man dropping off 2016 Good Beer Guides. 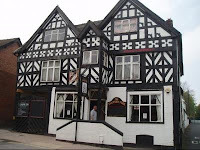 He’d been to the game and started chatting; he was surprised we knew of the Red Lion and the Lion’s Tale micro-brewery. Nothing gets passed the PRATS R&D department. So that was it for another PRATS day out, Market Drayton is a great place to have a few decent ales at very good prices all less than £3.00 a pint. Next week we go to Paulton, south of Bath, more great ales to be supped.